The cabbage maggot (Delia radicum) is the larvae stage of the cabbage root fly which can cause severe damage to all Brassica crops. The adult cabbage maggot is a fly that is about half the size of a house fly and is grey in colour. In the early spring, cabbage maggot flies emerge from the soil and the females lay small, white eggs ~2-10 cm below the soil line. Depending upon the temperature, eggs hatch 3-7 days later as larvae that immediately start boring into tap roots of susceptible Brassica crops. Small transplants and seedlings are most susceptible, and destruction tends to be worse during a cool and wet spring. Cabbage maggots feed on the Brassica roots for approximately 3-4 weeks before they pupate in the soil. During that time they eat the root hairs and create extensive tunnels throughout the roots, often killing or stunting the plant. Even if the plant is not killed, the roots are still at risk from secondary pathogens infecting through the wounds and feeding damage created. Figure 1. Broccoli wilted due to cabbage maggot damage. The cabbage maggot (Delia radicum) is in the same genus as onion maggot fly (Delia antiqua – attacks Alliums exclusively), seedcorn maggot fly (Delia platura), bean seed maggot (Delia florilega), and turnip root fly (Delia floralis), all of which are present in Ontario. Accurate identification of the adult flies, larvae and pupae requires the use of a microscope and a good key. The damage caused by the larvae can not be differentiated between the species. An AAFC project to survey Brassica fields in Ontario and other provinces was completed in recent years to determine which of these species was causing damage. The project also looked at whether the cabbage maggots sampled were resistant to chlorpyrifos (Lorsban, Pyrinex, Nufos etc. ), the primary control product for the last 25 years. This project is still ongoing so results should be available in the near future. There are no established thresholds for cabbage maggot so when you notice cabbage maggot damage, it is often too late. All management strategies are preventative since reactive methods like foliar sprays are generally ineffective. The primary method of control is through insecticides applied in-furrow or shortly after planting. Recently Verimark (cyantraniliprole), a group 28 insecticide has been registered for use on Brassica crops (see below). Use in the field has been limited so it is still unclear whether this product will be a suitable replacement for chlorpyrifos, but it could be a real option especially in areas dealing with resistance issues. Floating row covers have been tested in other provinces with some promising results but this strategy has not been adopted by Ontario growers, likely due to feasibility concerns. It is also an advantage to incorporate crop residues (including cover crops) at least 2-3 weeks before planting. Avoid manure applications before transplanting as this can attract adult flies. Since the first generation of cabbage maggots are the most damaging, planting seeds or transplants after the peak of egg hatching in the spring can provide some control. A degree day model with a start date of January 1st can predict the emergence of the first generation when the sum of the equation reaches 314. ∑=((Max Temp + Min Temp)/2) – 6°C. 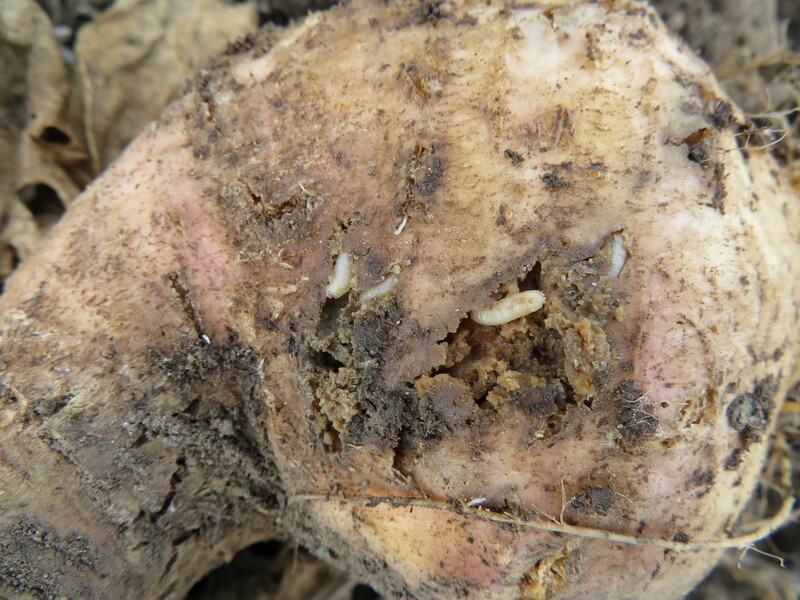 Rutabaga is uniquely affected by cabbage maggot as it is not only affected by stand losses from the 1st generation, but also from the 2nd and 3rd generation damage on the marketable portions of the roots. The larvae feed on the outside of the rutabaga, mining large feeding cavities (Figure 2). This late season damage has a real impact on the marketable storage crop, causing over 40% losses in some fields and in some cases, forcing growers to walk away from the field. Control of the 2nd and 3rd generation is difficult because of a lack of registered products, efficacy, the need for a short PHI and difficulty in timing the applications. There’s a need for research into application timing and new products, and one of those products just happen to be a biological control of all things. The use of beneficial nematodes may become a future management strategy that can be applied at the time cabbage maggot eggs are hatching. Nematodes, (Steinernema feltiae) applied as a drench, have potential to parasitize cabbage maggot larvae and limit the amount of damage. Timing, application and cost are current barriers to implementing this control method commercially. Research is currently being done by Dr. Mary Ruth McDonald at the University of Guelph – Muck Crops Research Station to find the optimal timing and application methods for commercial growers to achieve good control. Another unique and possible control method is to release sterilized male cabbage maggot flies in Brassica fields which causes females to lay unfertilized eggs. Projects with onion maggot in Quebec have shown that the costs to release millions of sterile flies outweigh the costs of conventional chemical control. A limitation to applying this method how scattered Brassica crops are grown throughout Ontario unlike the concentrated area of onion production in Quebec. There is a margin affect from neighbouring fields; as the acreage of treated area increases, the better the control. Cabbage maggot is likely the most difficult insect pest of Brassica crops that growers encounter in Ontario. Given the limited management options available, it is important to properly implement what strategies are available to avoid giving cabbage maggot any sort of advantage. To prevent the development of resistance, it is essential to always rotate between different insecticide groups when possible. Current products registered for cabbage maggot management are listed by insecticide group below. Always refer back to the label before application. Apply in 200 mL water/plant 32 Cabbage only. Transplant water treatment. Do not use with starter fertilizers. See label for recropping restrictions. 24-hr restricted entry interval. 1,000 m of row 32 Direct-seeded broccoli, Brussels sprouts, cabbage and cauliflower. In-furrow treatment. See label for recropping restrictions and restricted entry intervals. (445–687 mL/acre) — See label for complete list of brassica crops. In-furrow, transplant water or banded treatment. Do not make a foliar application for a minimum of 60 days following a soil application of any group 28 insecticide. See label for rotational crop restrictions. 12-hr restricted entry interval. 1,000 m of row 32 Broccoli, Brussels sprouts, cabbage, cauliflower and Chinese cabbage. Drench treatment. See label for application details. See label for recropping restrictions and restricted entry intervals. 15 Pak choy only. Drench treatment. See label for application details and recropping restrictions. 24-hr restricted entry interval. 1,000 m of row 21 Chinese broccoli only. Soil treatment. See label for application details and recropping restrictions. 24-hr restricted entry interval.